ISA25831FULLG Size: Large Features: -All seams designed away from pain sensitive areas like base of thumb. -Open cuff for easy on, easy off. -Full finger. -Lightweight spandex provides even compression throughout the hand to control swelling. Product Type: -Task aid. Number of Items Included: -2. Dimensions: Overall Height - Top to Bottom: -0.3 Inches. Overall Width - Side to Side: -3.5 Inches. Overall Product Weight: -0.2 Pounds. Overall Depth - Front to Back: -8 Inches. blend. Nylon/Lyrca spandex blend; machine wash. - Unisex sizes: SM, MD, LG. Eases pain and swelling from arthritis, surgery, repetitive motion and other hand injuries. The massaging qualities of the material and gentle compression provide immediate relief. Wear anytime, day or night, when hands are sore or swollen. Open cuff for easy on, easy off. 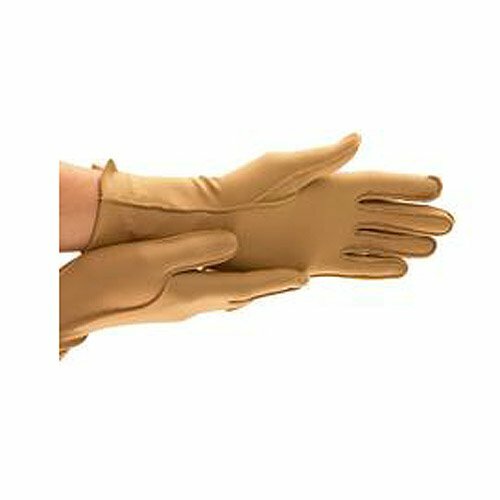 Therapeutic gloves are designed with the seams on the outside in order to lessen stress on tender hands.